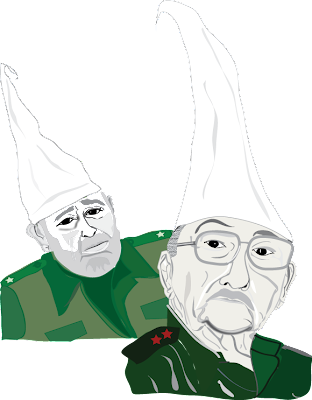 "Communist Cuba: 50 Years Of Failure"
The media is fawning all over the 50th anniversary of the monstrous revolution. I can't understand how anyone could still defend the dictatorship? 50 YEARS of what?Destruction....imprisonment.....death ....total power in the hands of one family? 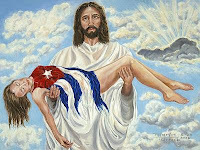 What has happened to Cuba and Cubans should make even the strongest of will cry, but boys don't cry! The Cure for Cuba: FREEDOM! The dictator says he is a terrorist! Here we have a special Christmas present from Jose Reyes. Click on the title and enjoy! En primer lugar, a contrario sensu de lo ocurrido en años anteriores en esta fecha y lugar, es decir, de la brutalidad desatada contra personas desarmadas e indefensas, en esta ocasión las fuerzas policiales uniformadas y no uniformadas se comportaron de forma irreprochable en el trato dado durante la detención, conducción y estadía de estos ciudadanos en las estaciones de policía donde se retuvieron para ser luego liberados y, en ocasiones, hasta devueltos a sus hogares en los vehículos de la policía, horas más tarde. 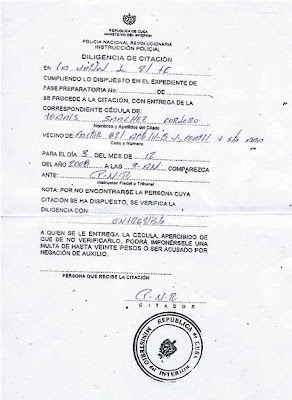 Me placería sobremanera, como lo fue en la primera parte de esta carta, poder constatar en una próxima oportunidad, que en este segundo aspecto de la triada ciudadanía-Derecho- autoridades el Ministerio del Interior, del cual es usted la máxima representación, se torna, cada vez más, garante de los derechos ciudadanos. "In defiance: Cuba's women prisoners"
She spent 16 years, nine months and four days in Fidel Castro's prisons, but it's what happened on Dec. 7, 1969, that still torments Georgina Cid. That cold dawn, prisoner Cid was ushered into a room in a forced-labor farm outside Havana with the government-imposed Orwellian name of America Libre, Free America. Two interrogators delivered an impossible ultimatum as a simple choice: Snitch on your group's anti-Castro activities -- on lacausa, the cause -- or we'll kill your older brother, who had been running CIA-backed raids on the island from Miami. Cid had already lost her younger brother, Eladio Jr., to the dictatorship of Fulgencio Batista during a shootout at the Haitian Embassy, where he had been hiding in 1956. And now, facing these two men -- just months after her father, Eladio Sr., had died of a heart attack in state custody under questioning -- she was supposed to help the regime? 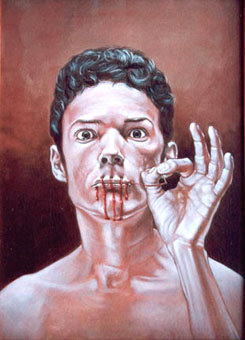 Francisco ''Paco'' Cid -- bruised, emaciated, his once sturdy muscles hanging from bone as he hugged his imprisoned sister for the last time -- was executed by a firing squad, leaving his widow, Ofelia Rodríguez, in prison and a young son. Thousands of women like Georgina Cid had to make tough choices. While Cuban male political prisoners have long captured the media limelight, the women have mostly kept their memories private. When set free in the 1970s and 1980s, these women set out to rebuild their lives in South Florida. Some earned university degrees; others worked menial jobs. Many married former political prisoners -- men who understood their pain and pride. Now in the twilight of their battle, the former women prisoners who are left -- many of them called plantadas because they were firmly planted against the regime and refused Marxist reeducation programs -- share a precious bond. Their stories, rarely told outside Cuban exile circles, stand as testament to these women's grit and defiance at a time when most women -- Cuban and American alike -- were expected to be prim and proper homemakers, not gun-toting conspirators for democracy. Cid was just shy of her 25th birthday when she was sentenced in 1961 to 20 years for hiding a gun ''to conspire against the powers of the state'' -- against a revolution she had embraced after Eladio Jr.'s death. When she arrived in Miami in 1979, she had become, like so many of the ferociously hopeful Cuban women of her era, a symbol of proud suffering, never cracked by jailers in a bloody, dysfunctional regime that sought to break them. Most of the imprisoned women had championed the revolution but turned against it once Castro stopped talking about building a big political tent for democratic ideals, and started building prisons instead. So the women hid young conspiracy-hatchers, cooked up Molotov cocktails, moved weapons and distributed anti-Castro pamphlets. They stole their Fidelista father's guns for the underground, learned to set up a radio station to incite the masses, or, like Zoila Aguila, known as La Niña del Escambray, took to central Cuba's hills to fight the new revolutionary army. They did everything and anything in the hope that the citizenry would find the nerve to rise up against a communist takeover of their young country. It was a tough sell in a climate of fear fed by hours of bloody executions showcased on TV. In prison, the women were punished relentlessly, which only brought them closer -- a ragtag sisterhood as diverse as it was united. Poor campesinas like Olga Rodríguez Morgan and Aracelis Rodríguez San Roman mixed in with the once upper crust of Cuban society, such as lawyer Albertina O'Farrill, who had been an ambassador's wife during the Batista years, and Polita Grau, the niece of a former Cuban president, Ramon Grau San Martín, who lived to regret his early support for Castro. There were a hundred of us women prisoners in Guanabacoa, and they wanted to transfer us to Guanajay, where the conditions were unbearable. . . . The prison was completely surrounded by about 600 armed men and women. . . . They turned [on] water hoses, with a pressure of 200 to 300 pounds. . . . There was one prisoner who was six months pregnant, and they aimed the hose directly at her stomach to make her abort. Many of us ran to protect and cover her with our bodies. The pressure of the water left a deep mark on our skin for about two months. Pérez, Cid, Morgan and Ana Lázara Rodríguez are among the dozens of women who survived that violent Mother's Day behind bars, coming just weeks after the exiles' failed, CIA-hatched Bay of Pigs invasion. Cid had just returned to her cell after a visit from her mother when she heard ''these terrible screams.'' The women started to bounce off the packed cell door to break the lock and join the fight. When the riot broke out in the yard at the Guanabacoa prison, Morgan was being punished in her cell. ''I was in Galley 5, and I'd been digging a hole to escape, so when we saw so many militiamen outside, I thought the authorities had discovered the hole. But no, it was a trap to transfer some women to Guanajay, and to beat up the mothers and families who had come to see us,'' said Morgan, who now lives in Ohio with her husband, James Goodwin. Morgan was a guajira -- a country girl -- who grew up in the tobacco region in a little house with a dirt floor in the kitchen and dining room. As a student leader in Santa Clara, she had fallen in love with William Morgan, the fabled yanqui comandante in Castro's rebel force. After Castro's triumph, the pair were relegated to running a revolutionary frog farm in Pinar del Río province, and an unhappy William soon began to conspire against Castro's tilt toward communism. Arrested in October 1960, William Morgan was executed five months later. By Mother's Day, 1961, Olga Morgan had left her two baby girls to her mother. She was now an imprisoned widow, sentenced to 30 years. Guanajay scared the women because it was built for the most violent common criminals during the presidency of Grau San Martín in the late 1940s. As Castro's regime cracked down, prisons like Guanajay were packed with six to 10 women in a cell built for one. Among the prisoners at Guanajay: Grau's niece, Polita, accused with her brother Ramon of counterrevolutionary activities, including helping 14,000 Cuban children escape to the United States through the Catholic Church's Pedro Pan program. In all, 65 women were taken from Guanajay to Baracoa, including Maria Amalia Fernández del Cueto and her baby daughter, Amadita, then only 23 days old and who barely survived the trip. The Baracoa cells had lice and rats, and there was no medical care, except for any help that prisoners Caridad de la Vega and Isabel Rodríguez, both doctors, would lovingly dispense to their younger cellmates. ''For six months, they had us there,'' said Gloria Argudin, who was a 20-year-old University of Havana secretary when her father, a Fidelista doctor, ran the campus clinic. One day, she decided to take some of his weapons and head for the Escambray Mountains. She was caught conspiring against Castro's government in 1960. Friends like Gladys Chinea, who was in prison with Argudin, recall how guards would taunt her with threats that her friend would be facing the paredón -- execution by firing squad. After Baracoa, the 65 women and the baby were returned to the Guanajay prison in 1963. They soon found a new revolutionary method of torture: Tapiadas, or covered cells. Eventually, some of the women would be stripped of their clothes and thrown into newly built cells with concrete slabs covering windows and a metal door that barely allowed a food plate and tiny pink cup to be slid through the slot. It baked in the tropical sun. The Internacional, the communist anthem, played incessantly. That suffering made them stronger. They would sing and crack jokes and taunt their jailers. And pray. 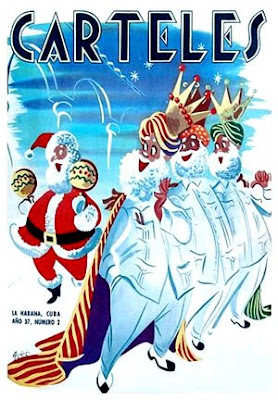 Grau, who died in South Florida in 2001, loved to play guitar and formed Christmas choruses to sing religious songs banned by the atheist regime. At Nuevo Amenecer, or New Dawn, a perverse misnomer for a work-camp prison in Havana province, Rodríguez San Roman remembers how excited the young women would get when Grau talked about her years as Cuba's first lady during her uncle's presidency. Rodríguez, Grau and La Niña del Escambray were among the last plantadas there in the late 1970s. 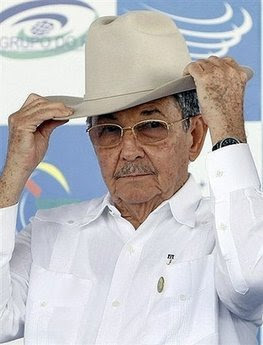 Rodríguez came from a big family of 11 siblings, country folks who grew rice, tobacco, malanga and corn in Pinar del Río. With only a sixth-grade education, Rodríguez is scrappy smart. She kept the books for the Frente Union Occidental, the Eastern Union Front, an anti-Castro group her uncle ran to disrupt commerce by bombing bridges. That uncle, Esteban Marquez Novo, escaped to the United States, trained with the CIA, and returned to Cuba to run missions and bring out some of his nephews between 1961 and 1964. Two of Rodríguez's brothers also returned on May 13, 1964. Gilberto was killed in combat. ''He had a machine gun, so he killed two or three of them,'' Rodríguez said. Her brother Arsenio escaped but was on the lam for almost a quarter century -- hiding in Cuba until he left on a boat. When news of nephew Gilberto's death reached Marquez Novo, who ran the Frente, he grabbed his pistol and killed himself. That same day, Rodríguez, her father, uncle and another brother were hauled away. She was taken to the G-2 security office in Pinar del Río. They wanted her to identify her brother Gilberto's body. She was taken down a hall to a pile of clothes on the floor. ''They were full of blood,'' she said, her voice breaking, ``but I didn't see the body. For years, I didn't know if he was really dead. In 1979, Rodríguez left Nuevo Amanecer and came to Miami, among 3,000 political prisoners released by Cuba. She was 39 and about to be married to another prisoner. Since widowed, Rodríguez now takes care of her 98-year-old mother and her 94-year-old uncle, Ramon San Roman Novo, who spent 24 years behind bars. Fifty years. Families decimated by firing squad, suicide, guerrilla raids and long imprisonments. Women set free too old to have children. Hate? No. But justice, sí. ''I'm one of those people who doesn't forgive or forget,'' said Gladys Ruisanchez, who served 10 years in prison. Her father and her future husband were also imprisoned. Today, Ruisanchez helps organize events to bring the women together -- and find ways to help the opposition in Cuba, groups like the independent Democratic libraries run from people's homes and the families of ex-prisoners who remain in Cuba. La Habana, 15 de diciembre de 2008. 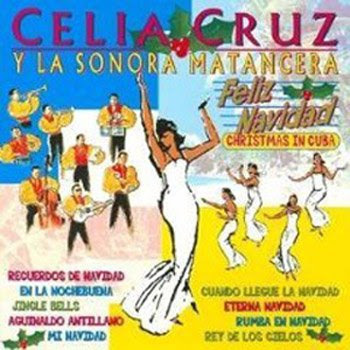 La oposición dio una gran lección de dignidad, de madurez cívica y determinación en su lucha por el reconocimiento y la protección de los derechos y libertades de todos los cubanos, el pasado 10 de diciembre, al celebrar en las comisarías el Día Internacional de los Derechos Humanos, luego de que la seguridad del estado impidiera la realización de la tradicional Marcha en el parque Villalón, frente a la sede de la UNESCO. En esta ocasión, aunque se mantuvo la política oficial de obstaculizar la actividad, la seguridad del estado cambió la estrategia, no utilizó el método de años anteriores, 2006 y 2007, cuando organizó turbas de personas violentas que, con total impunidad, agredieron física y verbalmente a los indefensos activistas de derechos humanos. El gigantesco despliegue de la policía política se concentró en interceptar a los convocados en las proximidades del parque y exigirles que regresaran a sus casas. Otros activistas tuvieron la visita de oficiales de la seguridad desde el día anterior para amenazarles y advertirles que no podían acercarse a la sede de la Marcha. De los más de 50 opositores conducidos a las comisarías muy pocos fueron arrestados de primera intención, pues la mayoría exigió ser detenidos al impedírseles llegar al parque. En las comisarías los arrestados celebraron dignamente el 60 aniversario de la Declaración Universal de los Derechos Humanos cantando el himno nacional, además de corear las frases de vivan los derechos humanos y viva la libertad. Los hechos demuestran con claridad las violaciones sistemáticas, de manera institucionalizada, de las libertades y derechos elementales que sufren las personas con pensamiento político distinto al que impone el gobierno. Además, es obvio el desprecio que manifiestan las autoridades del país por su propia legislación jurídica, y por los compromisos que han contraído internacionalmente, pues Cuba es firmante y signataria de la Declaración Universal de los Derechos Humanos y miembro fundador del Consejo de Derechos Humanos de las Naciones Unidas, y hace unos meses firmó los Pactos de Derechos Políticos y Civiles y Económicos, Sociales y Culturales de las Naciones Unidas, los que pronto serán ratificados, según recientes palabras del canciller cubano. También se ha decidido convocar públicamente a todos los cubanos para que participen el próximo 18 de marzo en un acto simbólico en solidaridad con los presos de conciencia, el que consistirá en presentarse en alguna comisaría y exigir ser detenido como mínimo hasta las seis de la tarde. La acción no representa un acto de desobediencia civil, tampoco se trata de una demanda de excarcelación de los luchadores por las libertades y derechos del pueblo cubano, simplemente radica en compartir el sufrimiento de esos hermanos, injustamente condenados, pasando unas horas en condiciones similares a sus encierros. Es hora de convertir cada aniversario de la Primavera Negra del 2003 en el Día de la Dignidad. Alfredo Guilleuma Rodríguez. Daniel Almeida Cuba. Jesús Almeida Cuba. Yusnier Osorio López. Lázaro Monzón López. Pedro Moisés Calderin Tápanes. Rafael Ernesto Ávila. Vladimir Calderón Frías. Alfredo Montaner Ramos. Julián Guerra Deriet. Zoila Hernández Díaz. Yasmany Yi Martínez. Miguel López Santos. Alexis Rodríguez Zapata. Miguel Amado Reyes Fonseca. Raicel Rodríguez Rivera. Pedro Fontanals Miranda. María Cristina García Mazona. Joaquín Sarduy Gómez. Nelson Herrera Ayala. Raquel Castillo Urquiza. Miguel Alvarado Marrero. Raúl Montanel Herrera. Carlos Raico Pupo Morgado. Wiliam Prior Peña. Jesús Adolfo Reyes Sánchez. Jorge Omar Lorenzo Pimienta. Carlos Manuel Pupo Rodríguez. Yusnaimy Jorge Soca. Darsi Ferrer Ramírez. Coming to a theatre near you: Brokeback Island! This past Thanksgiving weekend we took off on a short 1 day road trip..nothing special..just the family spending time together. Well since we have a large family something is always bound to happen, our oldest son was not feeling well and he vomited all over the back seat. We drove to a gas station and we spent over 2 hours cleaning the back seat and the floor! I was not a happy camper. My son's clothing were full of you know what, so my wife stopped at a discount store to buy him a shirt. She gives him the shirt and I hear "I AM NOT GOING TO WEAR THAT!" So I bark back: "Put it on now" and he responds; "dad, I can't wear this, this is what Fidel Castro wears!" I look back and it's a Adidas shirt! At that moment my anger disappears!!!!!!!!!!!!!!!!! The comemierdas R Us Club! 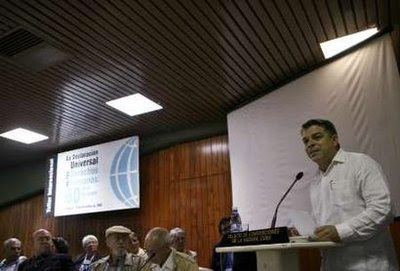 Here we have "lap dog"Roque speaking at 60th Anniversary of the Human Right Universal Declaration in Havana...what a joke..and what's really INSULTING, their are people who actually believe this mafia dictatorship. How long do the Cuban people have to endure this nightmare? H/T to Tomas Estrada-Palma for the drawing! 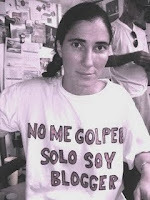 Friday FAST for ALL Political Prisoners in Cuba! En los inicios del proceso revolucionario cubano aun vigente, la total entrega del pueblo y su absoluta obediencia ante el nuevo mandato, generada por el rechazo a la dictadura y por la popularidad emanada de los actuales dirigentes, nos ofrecían una imagen de seguridad. Se había roto con un modelo económico y político para implantar otro diferente, opuesto en sus concepciones, lo que ponía a la luz, el desconocimiento y la inexperiencia tanto de los que dirigían, como de los que debíamos enfrentarlo y hacerlo crecer. Esto, facilitó que las respuestas ante las ordenes gubernamentales se aceptaran inmediatas y sin replica, si se deseaba alcanzar rápidamente, el objetivo bien lejano en ese momento y no logrado todavía hoy, dando la incorrecta impresión de parecer disciplina, pero realmente, eran imposición, obediencia y mas adelante... miedo. Se planteaba que lo primero era hacer [las ordenes se cumplen, no se discuten] y luego pensar.Ya desde aquí se iniciaba la manipulación emocional del pueblo. Así lo demostraban aquellas consigna con las que nos arrebataban la iniciativa y los derechos. Fidel, Fidel, dinos que otra cosa tenemos que hacer. Sobra el comentario. 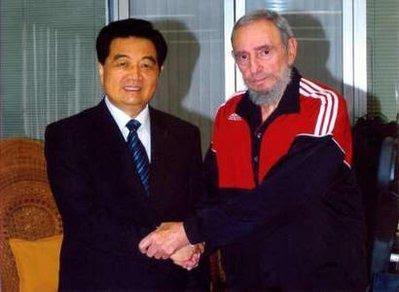 Fidel, Fidel, siempre cumpliremos con nuestro deber. ?Cual era nuestro deber¿, tampoco lo teníamos claro. Cumplir con el deber, era simplemente eso, obedecer. La disciplina, es el acatamiento de leyes establecidas previo análisis y aprobación de los mismos que las crearon, sobre todo en lo moral. En el caso actual, se había roto con una forma de disciplina, para crear otra, sin construir sus nuevas bases, sin el análisis ni la aprobación de los que deberíamos cumplirlas.Ya comenzaba aquí el estado, a ser juez y parte. El jefe, siempre respondiendo a la doctrina del único partido, a una sola ideología, guiaba dando las ordenes, de lo que parecía mejor para ellos y para el pueblo y este desconocedor y apasionado, ciegamente cumplía. Seguía esto sin ser disciplina. Se creía en aquel entonces, en el bloqueo y sus efectos sobre nuestras vidas, en el daño de la política imperialista y se esperaba con mucho amor y sacrificio, que el resultado demostrara que valía la pena. Pero no ha sido así y tras múltiples y diferentes intentos con un rígido modelo totalitario, con una superdictadura, no se ha conseguido el bienestar mínimo que se prometió, incrementadote por el contrario, la escasez y la pobreza. El trabajo en equipo imprescindible en el mundo moderno para conseguir el éxito, en una empresa tan grande y difícil como es elevar el nivel de vida de los habitantes de un país, no existía ni existe. Solo una cabeza pensaba, solo una daba las nuevas ordenes, solo una tenia también la mayor responsabilidad sobre lo que somos y tenemos hoy. El parlamento solo a servido para... el lamento. Pero sabiendo hacer las cosas, sin alardes ni petulancias, los de la cúpula se favorecían amparados por sus propias leyes y escondidos tras ellas, disfrutaban de sus privilegios que llegaban hasta sus familiares y allegados. La gran mayoría trabajadora, poniendo todo su empeño para alcanzar las metas, no veía esto y seguía luchando para el bien de todos, por tal de mantener la igualdad, que nunca existió y aquella esperanza, la misma que todavía hoy, nos invita a esperar los próximos cambios recién anunciados. Lo importante era salir adelante juntos, como buenos amigos, mejores hermanos y excelentes compatriotas. Poco a poco se fueron ampliando los ocultos ¨¨beneficios¨¨, para los dirigentes de menor rango, haciéndose mas visibles las bien camuflajeadas desigualdades, desarrollándose así, el desvío de recursos, la malversación y el robo que paulatinamente y en la medida que empeoraba el nivel de vida, aumentando la escasez y el hambre, iba creando un grado de corrupción, cada vez mayor, indetenible, canceroso, metastasico. La conciencia a la que se apelaba constantemente y que en algun momento surtio efecto, ya no existe, se enfermó, esatá enferma, tiene hambre tambien y necesita saciarla. La cantidad de directores, administradores y jefes cumpliendo condenas, se puede fácilmente calcular, por el numero de ellos en altos puestos y que a lo largo de todos estos años, hemos visto rodar sus cabezas. Han sido unos cuantos. Los que cooperan escapan de las rejas, pero son destronados, algunos para con un tiempo de silencio, regresar por otras vías, cerca de las anteriores alturas. Son los que se caen para arriba. Otros pasan a la disidencia o no se sabe mas de su paradero. Mientras solo robaban los jefes, no se hacia tan evidente la corrupcion. No mas se sumó el pueblo y se generalizó ante los ojos de todos. Es así como se deja ver, que aquello que parecía disciplina, no era otra cosa que imposición y obediencia, apoyándose en las obligadas concesiones gubernamentales para sostenerse en el poder y se va relajando primero y degenerando después, apareciendo la indisciplina laboral ligera, luego la moderada y finalmente la severa, siempre paralelas a la elevación de los niveles de corrupción e intercalada con la perdida de la educación formal que traíamos sembradas por nuestros padres y abuelos, demostrada por el respeto a las personas mayores y la casi nula utilización de las palabras llamadas ¨¨malas¨¨,que hoy, en boca del hombre nuevo, nacido con la revolución, reforzadas por la vulgaridad creciente y la mediocridad derivada de estos sistemas, se han convertido en ¨¨buenas¨¨, usuales, para con ellas, argumentar las razones de las frecuentes indisciplinas sociales y laborales que no hay ya quien consiga detener, inundadas entre los bajos salarios, los altos precios del mercado y la desigualdad en aumento, que entre otras cosas se estimula con la presencia de tres monedas circulando y la nueva posibilidad de adquirir artículos que están fuera del alcance de la inmensa mayoría del pueblo. En medio de esta profunda crisis de poder y su influencia social, puesta en evidencia no solo por los casi 50 años transcurridos sin resultados. Por las miles de quejas recogidas en asambleas laborales y escuchadas en todas partes. Por el ilimitado numero de cubanos que de una u otra forma consiguen salir pudiendo ver y comparar otros sistemas y maneras de vivir, así como el incremento de la facilidad con que por diversos medios nos llega información libre, lo que permite una visión mucho mas amplia del futuro, en medio de todo esto, se reinicia una ofensiva contra las diferentes formas de indisciplina a las que de paso se les achaca parte de la culpa de lo dramático de nuestra actual situación. El estado no tiene nada que ver con las indisciplinas, que no facilitan el avance del proceso revolucionario y que por eso, hay que erradicar con constantes y exigentes supervisiones. Las calles destruidas y embasuradas, los edificios apuntalados, las fachadas sucias, los hospitales cayéndose, sin ascensores, ni baños o con salideros y cucarachas, los comercios con pésimo aspecto. Nada será culpa de nuestro sacrificado estado, todo lo será, de la indisciplina social, del pueblo, como si el estado no fueras un padre o educador, como si no hubiésemos aprendido a ofender y gritar con el, como si no hubiera sido el, quien nos enseñó a robar de manera tan amplia a todos los niveles y sin limites. Pero si no se hace algo para frenar las tantisimas indisciplinas laborales y sociales que vemos a diario, no se percibirá, ni la preocupación, ni la autoridad del estado, la imagen del modelo dañada ya para los mas ciegos, empeorara y las consecuencias serán fatales primero para el gobierno, luego para el pueblo. Hay que detener esa muchedumbre de trabajadores informales que vendiendo de todo en las calles demuestran lo inutiul de laborar para el estado y lo frecuente del desvio de recursos inadmisible en un pais socialista. Pero también la irritación de los que vemos la realidad y culpabilidad estatal con impotencia, nos puede en algún momento hacer explotar. De ahí la nueva ola de represión iniciada hacia los disidentes que después de tanta fanfarrea nada se hizo contra ellos por falta de razón, pero aumentó la alerta, siempre reactiva en nuestros cerebros, para que no razonemos y solo pensemos en sobrevivir. Para que veamos menos la verdad, con mas miedo. Se reinicia una ofensiva contra toda clase de indisciplina, sin los debidos cambios que desarrollen, el compromiso personal, el mismo que surge de la perspectiva, de las ilusiones, del bienestar, de la mejoría, de la libertad, todo lo cual, contribuye a la recuperación de los valores perdidos, con medio siglo de absolutismo y pobreza. Se pretende retrotraer la disciplina con ¨¨muela¨y coacción, con el mismo miedo sembrado en nosotros, desde siempre. Ningún gobierno tiene que solicitar ni disciplina, ni mayor esfuerzo y sacrificio de parte del pueblo, para que alcancen mejorías en sus vidas, con lo cual, nos culpan indirectamente, evadiendo el, la responsabilidad que tiene su modelo en este asunto. El ser humano que se siente moralmente motivado, estimulado y materialmente recompensado cuida su estatus social, cumpliendo con todo lo necesario para mantenerlo, entonces difícilmente incurra en indisciplinas laborales.Y las sociales, el sabe lo que le cuesta cuando hay quien las hace cumplir. Pedirle al pueblo que combata las indisciplinas sociales, es nuevamente enfrentarlos entre si y hacerles el trabajo a quienes les corresponde, siendo su obligacion, el cumplimiento de las leyes. A los cubanos que nos falta todo esto, nos a llevado a un estado de indiferencia crónico y mantenido, debido al poco interés que generan los centros laborales, sus comedores, sus baños, sus salarios y sus pocas comodidades y facilidades en general y las remotas posibilidades de mejoría esperada. Cuando el trabajador siente el bienestar emanado de su labor, ese mismo bienestar, le impide dañar ninguna propiedad estatal o particular y agredir a otros, en su afán por conseguir lo que no tiene, que lo puede adquirir normalmente con su salario. El cubano, hace mucho que no conoce el bienestar y la comodidad, ni en su casa, ni en sus calles, ni en su centro laboral. Entonces,resulta facil darse cuenta que las indisciplinas, se engendraron con el cambio del sistema, hacia la actual autocracia que no garantiza nada y se manifiesta incapaz de alcanzar mejoras. Por eso, dudo mucho que sean recuperables después que todos sabemos claramente, que las pagas son insuficientes y que no hay forma de elevarlas, que tenemos que seguir luchando por nuestra cuenta para sobrevivir con las tres monedas circulando, por que el estado, lo que nos sigue pidiendo es sacrificio y esfuerzo, cada vez con menos esperanzas de avanzar, por lo que ya hacemos oídos sordos abiertamente. No mas justificaciones ganadoras de tiempo que nuevamente hagan olvidar los compromisos contraídos con el pueblo. Basta de manipulación. La única solución de mejoría de las disciplinas son los cambios que permitan que esa necesidad de tenerlas, sea espontánea para disfrutarlas de verdad. Las disciplinas están secuestradas por el modelo que hoy nos dirige, por eso, es a el, al que hay que modificar, tanto, que podamos apreciarlo diferente y capaz, para que no haya que exigirle, de las disciplinas, su rescate. ¿ QUIEN DA MAS ? La subvaloracion a la inteligencia y la fuerza que posee los ciudadanos de un país, le puede costar bien caro a un gobernante que no la utilice en el momento adecuado, cuando ya ese pueblo este maniatado y atrapado bajo su total dominio. Antes, repito, le puede costar el puesto sin conseguir su objetivo. El absoluto poder. Cuidado señor presidente, el pueblo Venezolano es aun por suerte, libre. Los cubanos estamos francamente en el después, porque entregamos ciegos toda la confianza a un triunfador que nunca ganó, a un ¨¨líder¨¨ por abandono del oponente y con ese error, regalamos también la iniciativa la voluntad y los derechos. La confianza, su exceso, nos condenó al silencio y la esclavitud. Es esa la razón de que no supiéramos apreciar, que las autocracias avanzan con pasos sutiles, callados, ocultos en las sombras. O, tras una situación de confusión que permita darnos cuenta de los hechos después de ocurridos, nunca antes, sino después de aprobados, levantando la mano unánimemente, por embullo, por aceptación, automáticamente. En otros casos, contagiados por la emoción colectiva, como respuesta a alguna aparente o real injusticia, o ante actos de barbarie muy bien aprovechado. Así hemos dado siempre nuestra aprobación, enrolados en convicciones ajenas. Esto demuestra que el método empleado para alcanzar el objetivo es fundamental, definitivo.Y el momento para anunciar cambios, crucial. En eso nuestro presidente ha sido una espada. El tuvo claro siempre cuando debía comenzar a subvalorarnos, su preciso lugar, por eso ha llegado hasta aquí. Nadie que se diera cuenta del peligro inmediato, aceptaría fácilmente asumirlo con tal espontaneidad. Por eso tiene que estar oculto al máximo el propósito, difícil o imposible de ver para la mayoría. Es en ese momento donde el artista se luce haciéndolo invisible, para poco después, en su exacto instante, ponerlo a la vista de todos pero ya con absoluto control sobre la respuesta, con la seguridad de su aprobación. Así nos ha ocurrido a los cubanos. Que tantas personas no perciban el dominio que ejercerán sobre ellos y la dependencia infinita que padecerán, hasta que sus consecuencias no se lo indiquen, es una muestra del método correcto, una prueba de innegable astucia, habilidad y confusión social. Así comienzan los totalitarismos su lenta y aplastante labor. Dan primero, prometen dar mas después. Quitan lo primero que dieron y siguen prometiendo, cuando las esperanzas ya están sembradas y sus raíces bien implantadas. Esa esperanza que hace soñar conque nuestro esfuerzo, sacrificio y paciencia, serán capaces de alcanzar lo que se supone que merecemos, lo que finalmente disfrutaremos. Esa es la trampa a esa altura, ya tendremos dueño y estaremos inmovilizados. Pero las promesas tienen fechas que en estos sistemas casi nunca pueden ser cumplidas, debido a la presencia del enemigo, ese que tiene que existir [en este caso compartido], para constantemente oponerse al progreso y desarrollo de la mayoría trabajadora, esa mayoría que ciega de recibir sin merecer lo que nunca tuvo ni luchó, no sabe apreciar cuanto le costará, aceptar lo que no se ha ganado y entonces, empujada, se enfrenta a todos menos al régimen. El enemigo, el amigo, el hermano se prepara militarmente con ahínco para defenderse de las posibles agresiones, esas que casi tenemos encima, que casi hemos sufrido como cierta y que en el caso cubano, no ha llegado ni llegara. 50 años son mas que suficientes para haber tomado la decisión. Nadie atacará ahora a un anciano moribundo y menos el recién electo presidente que va contra la guerra. Haciéndolo, solo conseguiría elevar su imagen recordada nada mas que por sus impopulares reflexiones. Pero los bastiones y las guerras de todo el pueblo siguen y los gastos que esto implica, afectan nuestra economía y no permiten a la cúpula cumplir su palabra por culpa del imperialismo. Es entonces que nuevamente se nos pide un postrer esfuerzo, un sacrificio mayor, para alcanzar lo que ya se ve, el ansiado triunfo, que aunque aun lejos, ellos lo ven [?]. El incremento del producto interno bruto lo esta gritando. Solo tenemos que modificar alguna leyes impuestas por el gobierno anterior para que respondan a los intereses del pueblo, porque hoy son un obstáculo para llegar a la meta. También se hacen necesarios dichos cambios, para dar respuesta a la intensa escalada que contra nuestro país, emprende el enemigo. Y fue así que se cambió primero y se modificó después nuestra constitución, iniciamos la furia de cambios constitucionales en América Latina. Fue una necesidad porque las nuevas ideas y proyectos, nos lo exigían, para hacer mas fuerte y segura nuestra masa, en manos de quien estarán los bienes de todo el pueblo, que así, tomará decisiones mucho mas justas. El pueblo no tiene que temer, ninguna ley lo perjudicará. Con estas nuevas leyes, recibirás tu titulo de propiedad, pero... podrás vendérsela solo al estado. Es tuya, pero... si tu hijo no trabaja la tierra no puede heredarla. Es tuya, pero... no puedes regalarla, ni cederla a nadie. En fin es tuya aunque no tengas poder de decisión, ni derechos sobre ellas. Esas, son tus propiedades, ese es el poder del pueblo en los totalitarismos. Mas ejemplos cansarían todos son iguales. Juegos de palabras en el que te ves dueño y no te ves, en el que tienes derechos y no los tienes, en el que todo será consultado y aprobado por el jefe. Luego los hijos de la constitución se impondrán para dejarte definitivamente fuera del juego. Ellos si son aplastantes, tajantes, únicos, definitivos, inviolables, absolutos, fantasmas a veces. Se trata de ¨¨los decretos, los infalibles decretos¨¨ y su esposa ¨¨las circulares¨¨, hechos por una persona y aprobado no sabemos por quien, pero que inobjetablemente hay que aceptar, incluso como ya dije, a veces son fantasmas, no están escritos en ninguna parte. Los hijos que siempre gobernarán son peores que la madre, que de por si, es de madre. En mi país, la estrategia fue segura y exacta, por lo que no hubo tiempo de analizar nada, en muy poco se hizo todo y se aprobaron los cambios constitucionales y ni cuenta nos dimos. Por curiosidad he preguntado y nadie recuerda haber aprobado tal aberración. Pienso que vuestro presidente, debió como en otras oportunidades asesorarse en el método, tan importante en este tipo de acción porque ese pequeño detalle, le dará al traste con el resultado. Esa discretísima enmienda que pretende hacer le da todas las oportunidades al presidente, esa simple frase a suspender lo cambia todo. ?Es pueril o inocente para pensar que será aceptado¿ Evidentemente lo querrá imponer para acusar a la oposición de bandoleros en contra del pueblo. El culto a la pobreza. El mismo discurso en 50 años haciendo hincapié en los desposeídos. La continua propaganda en busca de la igualdad, con el Imperialismo y el bloqueo como protagonistas. La imposición de una férrea, abarcadora ideología limitadora y atemorizante. El aislamiento y erradicación tajante de toda idea diferente o en contra de dicha ideología, discurso y propaganda. El cortante cerco tirado alrededor de las informaciones evitando que lleguen y lo subsidiado de la sociedad con sus cadenas de absoluta dependencia estatal, conforman un grupo de condiciones que evidentes e innegables, obstaculizan la movilidad y el criterio individual de los cubanos. Como resultado, se nos instalan la desorientación-confusión-desconcierto, que turban las perspectivas, propiciando que actuemos con ignorancia superficialidad y fanatismo, por automatismo e inercia, regidas por la pasión que ofrecen las esperanzas y la confianza depositada en los que discursean, defendiéndose entonces lo que parece mas justo y no lo que lo es, para rendirle sin verdadera convicción, culto a la pobreza. Este absurdo pensamiento, integrado a nuestras conciencias por una sutil y continua política dirigida, hace que veamos causas no fundamentadas, obsoletas como vigentes y puntuales, llegando a despreciar métodos desconocidos e impracticados, asumiéndolos como perversos, dañinos y culpables de la triste manera en que viven muchos infelices sobre la tierra. Esos pobres existen, nadie puede negarlo pero los motivos de su actual destino han sido tergiversados y sembrados así en las cabezas de ellos mismos, siendo utilizados por vivos, corruptos y enfermos de poder, para esgrimirlos y cambiar el camino mas lógico y practico, utilizado por los mas inteligentes y desarrollados con resultados ampliamente demostrados. Ya no pueden arremeter contra capitalistas de ideología liberal, ahora lo hacen contra países comunistas con línea neoliberal, como Viet Nam o China, Polonia o Republica Checa, o, evitan mencionarlos incrementando sus ataques hacia EE.UU y La UE, que marchan a la vanguardia económica del mundo, concentrando en ellos toda su propaganda distorcionadora, haciendo énfasis en las guerras y las muertes de inocentes para acrecentar la aversión y desviar el sentido del pensamiento equiparando el concepto económico empresarial, de mercado y competencia, con el lanzamiento de bombas y ataques militares que son otra cosa. Sus militares están en la guerra, justa o no. Sus habitantes, obreros y profesionales en sus trabajos y sus casas. La famosa explotación del hombre por el hombre, la succión de la materia prima para quitarle a los pobres sus empleos y recursos, el racismo y la discriminación, la expansión territorial, son argumentos que a nadie convencen a la altura del siglo XXI como responsables de la miseria humana. La mezcla de todas esas supuestas razones, no han impedido que los que hacen lo debido enrumbando hacia la mayor libertad y apertura, avancen. Por suerte no en todos los lugares donde existe una gran pobreza, se consideran estas falsas causas con igual magnitud y eso desafortunadamente deja una brecha a determinadas acciones que al no llevarse hasta su posición mas productiva, limita la salida del bache y dan la oportunidad a gobernantes que no aplican justamente las normas del respeto a la ley y la seguridad, que usan su deshonrades y se aprovechan de la ignorancia del pueblo para sus fechorías, dando el margen para que los defensores del cierre económico se apresten a señalar los mismos defectos que siempre esgrimieron, dirigidos a desacreditar el modelo de apertura y mercado, infinitamente superior. Si el neoliberalismo y la globalización fueran responsables de la pobreza, en estos momentos que como reconocen los amigos del hermetismo, muchísimos países con cualquier ideología se suman a esa política, hubiera aumentado la miseria, sin embargo ocurre todo lo contrario. Solamente China con una apertura sorprendente a conseguido atraer hacia una mejor vida a mas de 250 millones de pobres, pero La india, Singapur, Taiwán y Viet Nam países todos de la parte mas poblada y pobre de la tierra utilizando este modelo, son hoy menos pobres. Mientras que en Latino América, zona en que mas se practica la política proteccionista, neopopulista de izquierda, con sus huelgas, revoluciones y secuestros, según cifras de las naciones unidas ha habido un aumento de la pobreza hasta mas del 45 % de su población. Un claro ejemplo es la Republica Bolivariana de Hugo Chávez, en que los niveles de pobreza entre 1999 y el 2004, pasaron de 43% a 53%. Fueron cerradas mas de 7 mil empresas privadas, aumentando el desempleo del 13% al 19% con un índice de corrupción menor de 3 y una población penal muy baja, de solo 62 por cada 100,000 habitantes, una gran cantidad de criminales sueltos en sus calles. Cuba no acepta ser enjuiciada según parámetros legales y no se adapta a ninguna manera de medir su progreso para evitar la comparación que dejaría sin aliento a los mismos que hoy desconocedores y pasionales, adaptados a la desinformación y la manipulación, asumen que viven en el territorio mas libre y prospero de la tierra. La Habana, 7 de diciembre de 2008. Esposado y con un oficial a cada lado me llevaron hasta una carretera intrincada en la periferia de la ciudad. El chofer detuvo el carro detrás de un auto pequeño, de los conocidos como “panelitos”. Después de algunas llamadas desde sus celulares, me bajaron del Lada y sin decir palabra me subieron al reducido espacio trasero del panelito, donde me hicieron sentarme en una silla y casi encima de mí se sentaron los mismos dos oficiales que me custodiaron en el Lada. "Benedict Arnold" REALLY researched the role of Che? What? Can't answer the SIMPLE questions? H/T to fantomas at Abajo Fidel/Down with Castro for the video! "Actor Benicio del Toro says protesters at the Miami screening of "Che" should have watched the film first." No comemierda..you should have talked to those who suffered under guevera's cruel hands...you should talk to those EXILES and find out about the executions, the political prisoners, and ALL those who have suffered under guevera and the castro mafia and their destructive philosophy. "The COMEMIERDA OF THE YEAR AWARD"... congratulations!!! The dictator always dictating in HIS OWN terms what should be done and he thoughts about everyone. HE knows it all..EXCEPT how to show compassion for his OWN people. En 50 años de revolución, nunca se ha visto una huelga ni una verdadera manifestación de protesta en Cuba. La pregunta es ?a que se debe esto si vivimos enclavados en un área, en la que resulta casi normal. Que nos diferencia, que este tipo de discordancia nunca se ha concretado¿. La respuesta es, el sistema de gobierno que aceptamos. Se supone que cuando el poder esta en manos del pueblo, el mismo no se va a protestar, debido a que las decisiones salen de sus criterios. Cuando de esto se trata, es el pueblo el que manda. Para controlar, es el estado quien impone. Esa es la razón por la que se proyectan imágenes de Estados Unidos, Canadá y otros. en las que el sector de la medicina por citar un ejemplo, difiere y deja de trabajar en demanda de salarios mas decorosos, o los maestros no acuden a las escuelas por las mismas razones, desfilando pacíficamente para demostrar su inconformidad, o critican al presidente y lo acusan, sin que nada les ocurra. Son lugares, en los que se respeta el derecho y las leyes, protegiendo a los manifestantes de cualquier ataque venga de donde venga. En nuestro patio se le prohíbe a un grupo de mujeres, caminar pacíficamente en oposición a las injustas condenas de sus esposos, presos de conciencia, se les amenaza y se les maltrata, todo en nombre del mismo pueblo que sufre reprimido. El colmo es que lo sabemos, estamos en desacuerdo y no podemos manifestarlo abiertamente, solo hacemos comentarios en la subsociedad. Las marchas de apoyo al régimen son organizadas aprobadas y estimuladas por ellos mismos y tienen carácter legal. La gran masa acude sin deseos pero comprometidos por alguna de las numerosas organizaciones a la que pertenece. Tampoco puede demostrar su desacuerdo que lo dejaría a la vista como un disidente. Los profesionales cubanos tenemos el sueldo mas bajo del mundo, 25 dólares y vivimos distantes, de la manera decorosa en que debíamos en muchas ocasiones sin un hogar propio, ?a que se debe que no organicemos una huelga o una marcha para demostrar el disgusto que hoy se retuerce interno en nuestros corazones, atrapado por la impotencia¿. Se trata del cuento del elefante de gran tamaño que sujeto por una cadena fina y una frágil pequeña estaca, descansa tendido sin hacer el menor esfuerzo por escapar. Alguien que pasa comenta con el cuidador su asombro por lo fácil que le resultaría safarse y huir, a lo que este responde. -Esa es la misma estaca y cadena que le pusieron cuando, muy joven aun, comenzó a ser domesticado. En esa época, hizo ingentes esfuerzos por soltarse pero sus energías no eran suficiente. Ahora le sobran los bríos, pero ya se cansó de intentarlo, se acostumbró a no ser libre-. Esta triste historia del elefante, solamente la repetimos los cubanos en el continente. Fueron los tantos años de formular, la pregunta imposible de responder, buscar las soluciones que no debemos encontrar y no seguir por el camino elegido, por estar prohibido tomarlo. Tanta dirección, miedo y dependencia. Tanto chantaje, han hecho de nosotros los mas dóciles habitantes de la tierra, incapaces de desprendernos de una cadena que ya hace mucho podemos vencer usando la desobediencia. De manera que los mínimos momentos y personas que por sobre todo esto, demuestran su oposición y desacuerdo con algunos de los parámetros, conductas o lineamiento exigidos por el estado, son severamente reducidos, por bandas o turbas organizadas y estimuladas por el régimen, aunque se haga notar que su respuesta es rápida y espontánea, producto del sentimiento del pueblo, contra un grupo de traidores. Otros, serán juzgados o desaparecidos, siendo además vistos por sus propios conciudadanos como aberraciones del proceso mas puro y sincero que existe en país alguno. Tal ha sido la toma de sus convicciones. En esto también hemos sido ejemplo y su clonación, se está desarrollando como veloz león que destripa cuanto animal incapaz de defenderse alcanza, alimentándose de su carne y su sangre. El caso actual de Nicaragua es el mas cercano ejemplo cuando su presidente Poncio Ortega, o Daniel Pilatos, se lava las manos como señal de imparcialidad ante una burda tribu que ensordecedora y enardecida por un discurso conocido, se deja arrastrar por políticas de corte populista y arremete contra sus hermanos por solo pensar diferente y querer hacerlo patente, en esa nueva imagen de enemigos con que los han disfrazado. Es una vieja practica de los neopopulistas incentivar el odio y la separación entre personas que difieren en ideas. En ellos, eso no es posible. Los que no piensen igual, pueden convencer del error en que incurren otros, apareciendo la debacle en la intención de imponer una dictadura, propósito final de los proteccionistas de izquierda. Ya Ortega lo pasó y no quiere correr aquel riesgo que le costó la sombra, la penumbra y el olvido. Estas ilegales conductas de indiferencia estatal y apoyo indirecto contra el derecho, deben ser criticadas a los niveles correspondientes para que pierdan fuerza y no ganen en popularidad, o crearse leyes mas difíciles de violar para condenar conductas que no dejan ver los auténticos deseos de los pueblos contra lo que consideren dañino para sus vidas, o contrario a sus deseos. Se deben evitar los elefantes domesticados, y aceptar la inconformidad correctamente planteada, por el bien de la humanidad. Cuba deberá ser el`primer criticado por el uso de estos métodos en América Latina, ahora mas, que es firmante del pacto de derechos humanos, condición que no solo le exige una conducta mas libre y democrática para los suyos, sino que le obliga llamar a la justicia social, a su hermano de sueños. Luis Rafael Morcoso Pérez, de 3 años de edad, vecino de Calle A Edificio 18 apto. 9 entre Oria y Oquendo, Reparto Virginia, Santa Clara, Villa Clara. Hijo de Cora Lucía Pérez y Rafael Luis Morcoso Ibar. Con teléfono comunitario 042283940. Este niño sufre de una malformación vascular venosa congénita en el carril izquierdo inferior, labio inferior y lengua. Los médicos que lo atienden le dijeron a los padres, que podían operar al niño, pero que eso se reproduce. La madre del niño quiere saber si en otro país con tecnología más avanzada se puede hacer algo por su hijo. Manifiesta la madre que el niño debe comer la comida al tiempo, no puede llevarse a la boca alimentos fríos ni calientes, si se da un golpe en la boca tiene peligro de hemorragia, por lo que se toman medidas extremas con él durante sus momentos de juego. Pueden también a través de este correo electrónico o por el teléfono 537 6406821, contactarnos si existe alguna posibilidad de ayuda humanitaria. Ciudad de La Habana, 29 de noviembre de 2008.